The posting of colors was conducted by a multi-branch JR-ROTC Color Guard. 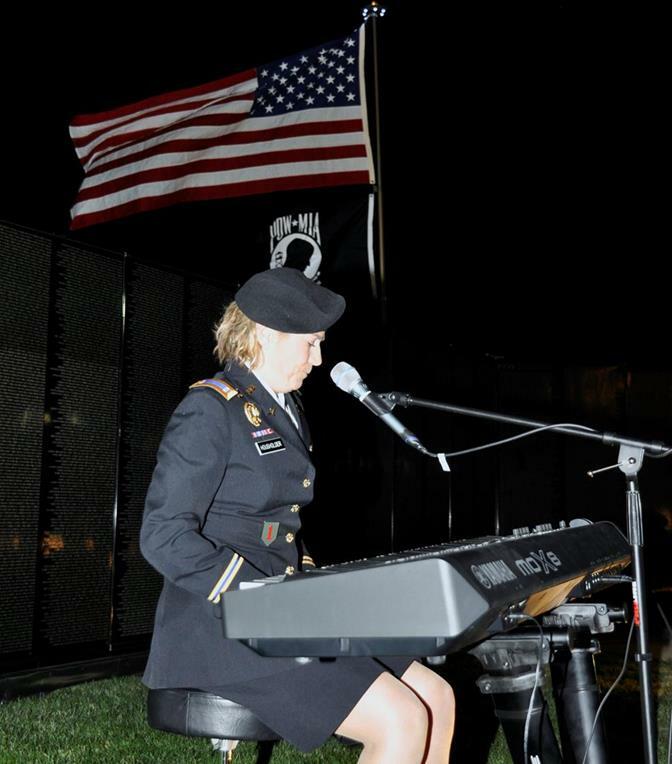 PALMDALE – Nearly 200 people gathered at the Palmdale Amphitheater Friday evening (11/8/13) for an opening ceremony for the Mobile Veterans Memorial of the Antelope Valley (AV Wall). 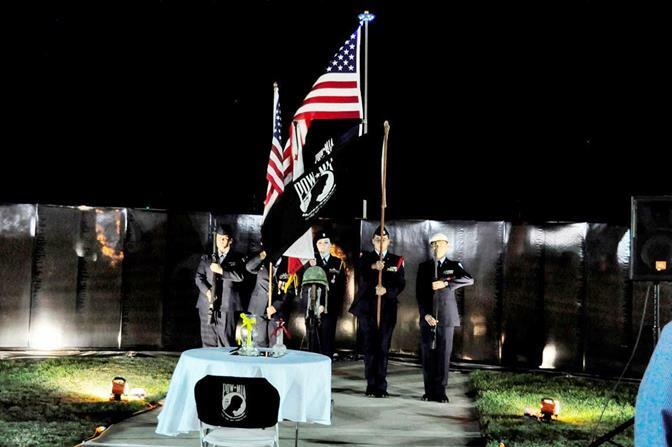 Palmdale Mayor Jim Ledford said the AV Wall provided an “awesome opportunity” for the community to pay tribute veterans. The solemn hour-long ceremony included the posting of colors by a multi-branch JR-ROTC Color Guard; a Table of Honor Ceremony conducted by Highland High School Air Force JROTC as Master Sergeant Gerald Lockwood played Battle Hymn of the Republic on trumpet; a musical performance by Army Chief Warrant Officer 2 Jen Housholder; a 21-gun salute; and speeches and reflections from Palmdale Mayor Jim Ledford, Major Conrad Hernandez, and Vietnam Veteran George Palermo. 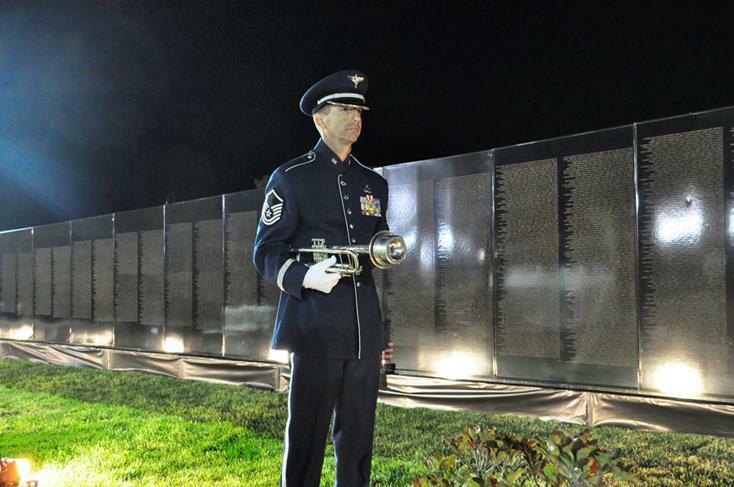 The AV Wall contains the engraved names of 58,286 men and women who gave their lives or remain missing, including 76 fallen heroes with ties to the Antelope Valley. 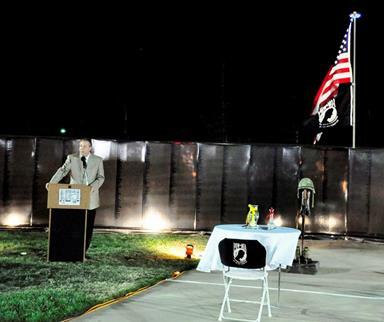 “This wall is a symbol of peace and it’s a healing wall,” Vietnam War veteran Phil Roberts said after the ceremony. 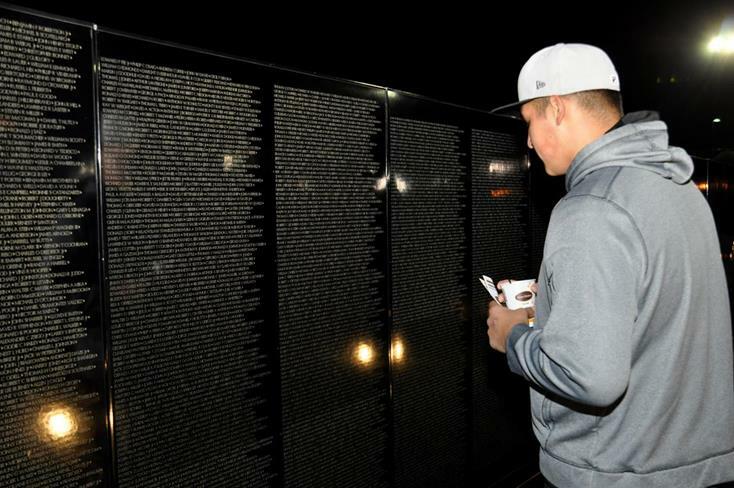 The AV Wall will be on display (with 24-hour-a-day public access) through Tuesday, Nov. 12 at 8 a.m., to allow veterans and community members a time for reflection and healing. 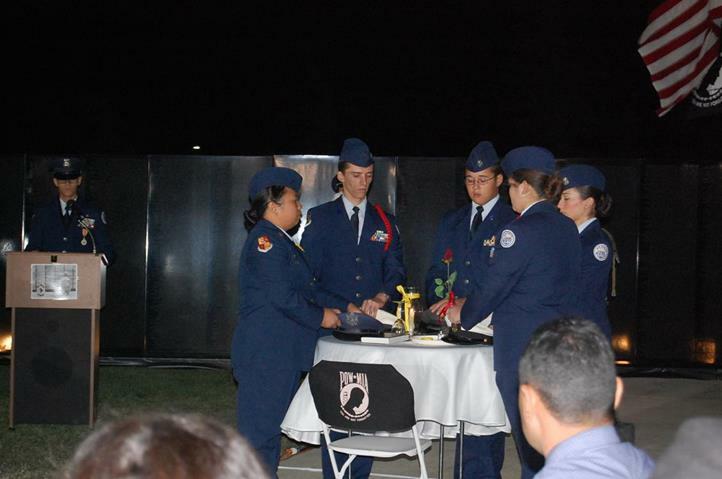 A Veterans Day Ceremony in front of the AV Wall is set for Monday, Nov. 11, beginning at 11 a.m.
A Table of Honor Ceremony was conducted by Highland High School Air Force JROTC. Master Sergeant Gerald Lockwood played Battle Hymn of the Republic on trumpet. 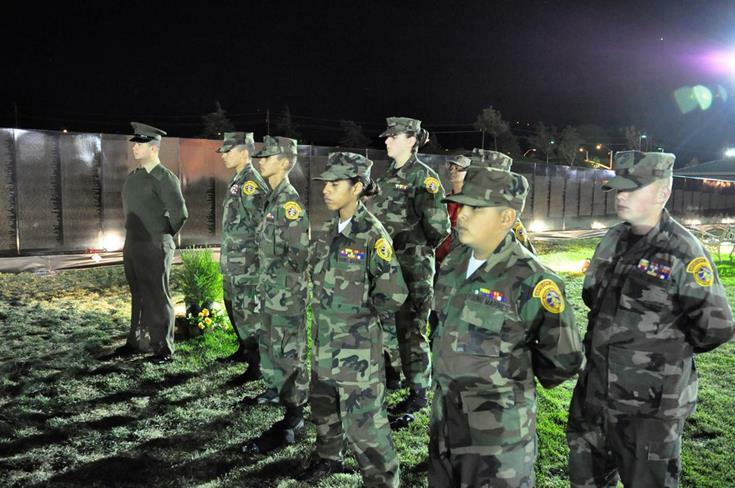 The Antelope Valley Young Marines took part in the ceremony. The Antelope Valley Community queens were also on hand for the ceremony. 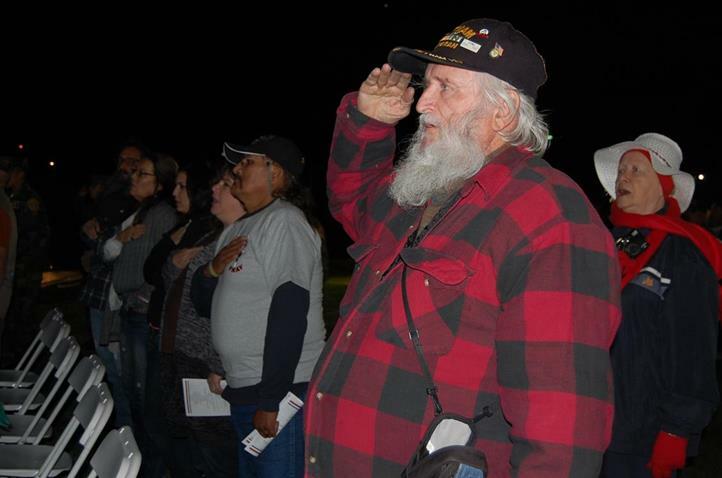 Vietnam War veteran Phil Roberts said the Wall was a symbol of peace and healing. Many attendees paused to reflect at the AV Wall after the ceremony. 1 comment for "AV Wall Opening Ceremony"
You guys and gals make us a stronger nation because of your Courage and Tenacious attitude. What can we do to ever repay your debt of sacrifice? All we can do for now is say Thank You.